Tuesday 13th May The Bishop’s Hunting Park in Highgate. Lecture by Malcolm Stokes (HADAS member). Successive bishops of London held land in both Finchley and Hornsey. The parish boundary between them passed through the hunting lodge of the bishops, and the park itself was fairly equally divided between the two ancient parishes now in Barnet and Haringey. The gates into the park were the Gatehouse in Highgate and the Spaniards and the site of the old White Lion where the old Great North Road passes under the railway bridge at East Finchley. The first recorded date for the park is 1227 but it could be a century older. It probably ceased to be used for hunting in the fourteenth century when the bishop started collecting tolls for crossing the park along the road from the Gatehouse to East Finchley. All that survives of the hunting lodge are the partial remains of a moat in Highgate Golf Course. Thursday 15th May Outing to Portsmouth to see the new Mary Rose Museum and, HMS Victory, HMS Warrior and the Royal Navy Museum. The AGM will begin a little earlier this year. This is because our President, Harvey Sheldon, will deliver a lecture after the meeting on “The London Walls”. We hope that members will come along and support the AGM and the President, who will chair the meeting and then proceed with his lecture. We hope that a large number of members will be present. Sunday June 29th to Thursday July 3rd: Long Outing to Kent. Tuesday 14th October Finding Neanderthal tools in Norfolk cliffs. Lecture by Dr Nick Ashton, British Museum. Sunday 7th December HADAS Christmas party. Over recent years, we have met at Avenue (Stephens) House for a social gathering. This has proved very successful and well worth repeating. Please note in your diaries that we have booked the Drawing Room, where we have our lectures, for Sunday 7th December. Details will be circulated in due course. As part of the History Project at Cromer Road School in New Barnet, we will be digging on the school field for the week starting Monday 9th June. This is a joint effort with UCL, and Sarah Dhanjal will be talking to the children and preparing booklets for them. UCL will provide some students, but we also need HADAS diggers, both to provide some muscle and to help supervise and aid the children. About 60 children from year 5 (10-year-olds) will be involved at different times. Prior to the event, we will survey the school field to help select our trench sites. We also hope to survey a grassy area in front of the school where we know there was a building in the 1940s. This should show some nice results for the children and teachers to see. The school plans to hold an open session at the end of the school day on Thursday 12th June, so that parents can see what we are doing. ● If you would like to help, even for only one day, please contact Bill Bass, Don Cooper or Jim Nelhams. he dug and there was a gold Roman coin. It bleeped again and there was another. When this had happened fifty times it struck him that he ought to report his find. So he went to the shop in St Albans where he had bought his detector, and with the shop-owner they told the museum. Then David went with them to the field, and more and more gold coins emerged, 159 in all. Nothing else; no sign of a container; and the coins were scattered around (probably the consequence of mediaeval ploughing), and at different depths, some virtually on the surface. It was sometimes difficult to see them, because their colour was like that of the sand in which they lay. They were taken to the British Museum, where they have been studied and conserved (though gold is so unreactive that it requires little but careful cleaning). David described the coins. 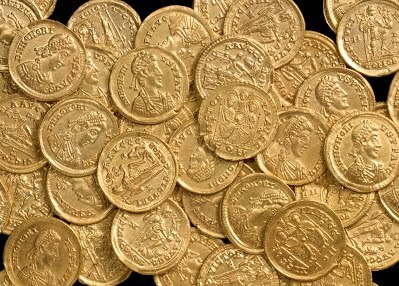 They were all solidi, the basic gold coin of the late Roman Empire. They were all very similar. Round the heads, which were scarcely differentiated, were the names of five emperors, from Gratian to the brothers Honorius and Arcadius (who ruled the Western and Eastern empires respectively at the beginning of the fifth century). Most of the reverses showed the symbolic crowning of the emperor by Victory while he was trampling on a barbarian enemy; there were a few different reverses, with a similar message, and one with a personification of Rome. The coins had mint marks, showing that they had originated from all over the empire; most of them were marked from Milan, but there were also examples from Trier, Rome, Ravenna, Lyon, Constantinople and Sirmium in Croatia. Late Roman gold coins are well made and quality-controlled (unlike the silver and bronze currency); David used mediaeval pictures to illustrate how this was achieved. 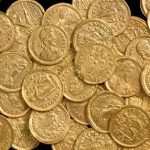 They did not circulate in the way that modern coins, or the Roman silver and bronze, did (though one of those in the hoard showed signs of wear); they were basically used for the payment of important officials and the army, and in the tax-collection system, and were regularly melted down and reissued. It is difficult to relate the values of solidi to the values of the other late Roman coins (in the way that is possible for the coinage of the earlier empire), but David gave some indication when he told us that a good-quality slave might have cost ten solidi. David, naturally, speculated on why these coins – which should have been returned to the state in taxes, and not retained by a private individual – came to be buried in a field by the Roman road north of Verulamium. The date of deposition was likely to be at the very end of Britain’s time within the Roman empire, say around AD 410. There was no reason to attribute a ritual reason for the burial; possibilities were a wealthy army officer going on a posting and putting his savings somewhere where he would be able to find them again; a wealthy merchant depositing them when he went on a business trip; or a wealthy landowner going with his family to Gaul when Roman order was breaking down, leaving his estate to be run by his bailiff, but hoping to return when control was re-established, as it had been on occasions in the past. The talk was very well presented, with many pictures of shining gold coins. David is preparing for the day when the coins come back from the British Museum, and are displayed – in very secure conditions – in St Albans. Work on processing finds from our excavations continues at Stephens (Avenue) House. Another major activity for the Sunday morning team is the writing-up and conservation of archives to museum standards for previous HADAS digs, e.g. at Rectory Close and Church Crescent near St Mary’s Church, Finchley. This area was investigated by HADAS in the late 1970s as the old rectory was being demolished for new development; the digs were well published in the newsletters of that period. However, over time the finds and paper archive (from many excavations) can get separated due to various factors such as a number of storage sites, the mounting of exhibitions, material going for specialist reports, different card records, photographic records and various filing systems etc. We are not alone as many societies have this problem – as indeed do major archives and museums. We trawl through our files and finds to pick up as many of the missing or separate elements as possible and assemble them as best we can. The following are really notes to give an idea of what we have done to the Rectory Close and Church Crescent archive to tidy it up and better present it. You will see that some material is not with us. In 1978 HADAS obtained permission to undertake investigations on the site of the old rectory gardens at St Mary’s Finchley, prior to construction of the Rectory Close sheltered housing. Three trenches were dug, A, B, & C, and as a result of the findings in trench C, after lengthy negotiations, a further trench – D – was dug the following year, 1979, in the garden of 33 Church Crescent. Of the 3 initial trenches, A & C proved worth continuing and B was closed. Trench A, nearest to the church, was 4m x 2m and excavated to a depth of 1.3m. Trench C, adjacent to the back garden of 33 Church Crescent, was 2m x 2m and excavated to a depth of 2.2m. Neither trench was excavated to natural. Both trenches revealed redeposited, mixed layers yielding finds from 13thC to late 19thC. This was due to landscaping of the grounds at the time the (now demolished) Victorian rectory was built. Trench C revealed the possible profile of a deep ditch. The following year, the edge of a shallow pit or ditch with pockets of metal detritus along the perimeter was found at 33 Church Crescent in trench D.
Levels in trenches are not always clear but markings on finds are in Roman numerals, e.g. stratum I, II, III, IV, V, VI, VII. Depths occasionally appear in cms. Both the finds and the paper archives appear to be incomplete in that we have a comprehensive bone catalogue detailing both sheep and cattle bone but no actual bone. This assemblage may have been discarded but there is no information concerning its fate. Likewise Part II of the original report details finds according to period but there is no finds report. Some of the finds mentioned are not present in the extant finds assemblage. We have re-bagged and labelled the finds in our possession; assembled the paper archive into a coherent form; and scanned and identified the photographic negatives using the existing site archive. It appears from the report that a number of yellow bricks which were referred to in a list were not actually from the digs but were surface finds made during the rebuilding period post 1973. HADAS Research Minutes refer to glass Salt Cellars + 2 stoneware pots; and the 17thC stoneware is also mentioned as being found at this time (1973), none of which is now present in the finds archive. A set of retrospective Finds Catalogue Sheets has been created (2014) which includes all small finds and other building materials including field drains, glass, metal and other finds that have not always survived into the present archive. Mary’s School, Finchley (site code REG90), about 200m north of the Rectory site. This found extensive medieval occupation – pot, hearths, beam slots etc. The archive of this site is stored at the London Archaeological Archive Resource Centre, Hackney. On Saturday 29th March, Jim and I were at Potters Bar Station at 7am. We were going on an outing arranged by our daughter Maria, for a family celebration. Just after 7.30, the Sir Nigel Gresley steam train appeared out of the mist puffing and steaming into Potters Bar. The platform was crowded with passengers, like us remembering these great pieces of engineering, once our regular mode of transport. The fact that we are still able to experience a journey on a steam train is all down to enthusiasts and volunteers. Our next stop was Stevenage, where our daughter, her husband, our son and his wife and our granddaughter Lara boarded the train. The sun was shining and we set off from Stevenage and puffed our way north. The journey took five hours as we had stops to replenish the water. This was accomplished with water trucks being brought alongside the train at convenient stopping points, and pumped into the tender. No troughs are still in place from which water could be picked up, no tanks at the stations today. We had a first class compartment, the carriages being of the old design with corridors. Our granddaughter was constantly wanting to look out of the window and was fascinated by the wafts of steam that floated past the windows. We had just over three hours in York and then the return journey. All along the route both ways there were big crowds of spectators, cameras at the ready to record the spectacle. A really splendid day out. Sir Nigel Gresley is normally based at Southall, and a recent picture in The Daily Telegraph showed it pulling carriages along the reconstructed track at Dawlish, originally planned by Brunel, which had been badly damaged by the winter storms. David Berguer, Chairman of the Friern Barnet & District Local History Society, has written a history of the Home Front in the Great War. The book, All Over by Christmas, describes what was happening around Barnet, Finchley and Friern Barnet while its men were away fighting on the Western Front. Based on articles in the local press of the time, letters from home and interviews with local residents describing everything from sugar rationing to Zeppelin raids, the book runs to 277 pages and has over 140 illustrations. Appendices include chronologies of the Home Front and the Western Front, details of Zeppelin and aeroplane raids over Britain, and lists of the war dead recorded in various local churches and on war memorials. Each month a different HADAS member edits this monthly Newsletter, helped and supervised by Sue Willetts and Mary Rawitzer. We have 11 editors. We need one more. It’s not difficult, involving mainly putting together items sent by others, though editors’ original articles are also welcome. We supply a helpful hints document and there’s always back-up. As seems to be becoming a regular habit, Royal Mail have increased the charges for postage stamps from 50p to 53p for 2nd class mail and 60p to 62p for 1st class. Although our newsletters are franked, which is cheaper, we would encourage all members to receive the newsletter via email. HADAS are holding the cost of membership subscriptions for another year despite these increases. PLEASE CONSIDER RECEIVING YOUR COPY OF THE NEWSLETTER BY EMAIL. I climbed the path up Salisbury’s garden and came out on a patch of waste ground at the top of the hill. There was nothing there except the remains of a small rectangular concrete base and a few broken bricks and other bits of rubble lying about among the weeds. I wondered what kind of building there might have been on this isolated site. A garden shed? Telegraph Hill, as I later discovered, was the site of an optical telegraph station constructed by the Admiralty during the Napoleonic wars as a means of communication with the fleet. The system was the brainchild of Lord George Murray, who proposed it in 1794. This station, built in 1807, was the second in a chain of 16 that connected London with warships lying in the harbour at Great Yarmouth. There were intermediate stations at Woodcock Hill, St Albans, Dunstable Downs, Lilley Hoe, Baldock, Royston, Gogmagog Hills, Newmarket, Icklingham, Barnham, East Harling, Carleton Rode, Wreningham, and Strumpshaw. 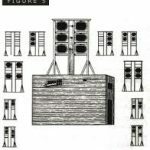 Each station consisted of a wooden hut surmounted by a vertical frame 20ft high holding six (later eight) wooden shutters. The shutters were connected to ropes by which they could be opened and closed in 63 different combinations, each representing a different letter or word. Twenty-six combinations stood for letters of the alphabet, 10 for the numbers 0 – 9, and 27 for key words. 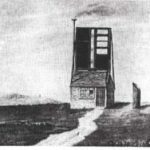 The stations were manned by Royal Navy personnel who observed the previous station in their chain through telescopes, received messages, and copied them on to the next station. At distances of 11 miles or so, the shutter movements were not always easy to read. But the system worked..
By 1808, 65 stations were in operation. Murray’s telegraph was a dramatic improvement on the old method of sending messages by a man on horseback, although the often repeated claim that the first chain could transmit messages from London to Deal in 60 seconds sounds like wishful thinking; and the claim that the telegraph was used to transmit the news of Wellington’s victory at Waterloo is disputed. What is certain is that the shutter system was abandoned in 1816 once the Napoleonic wars were over. It was replaced by a simpler system. ● Above left: A view of the telegraph erected on the Admiralty Office at Charing Cross in 1796 (detail). The National Maritime Museum has an architectural model, and there is a working replica of the shutter system in the Museum of Communication at Burntisland in Fife (www.mocft.co.uk). Friday 6th June – Sunday 29th June, 10am – 6pm. Museum of Water, Somerset House, Strand WC2R 1LA. Art installation to which you are invited to bring some water – a melted snowman, a baby’s bath … – in your own bottle to add to its collection. Phone 020 7845 4600 or contact info@somersethouse.org.uk. Saturday 7th June The City Lit Archaeology course: The Medieval Port of London, 1200-1500. For further information visit www.citylit.ac.uk or phone 020 7492 2652. Monday 9th June, 3pm. Barnet Museum & Local History Society, Church House, Wood St, Barnet (opposite museum): 200 Years of MCC at Lord’s. Talk by Penri Morgan. Sunday 22nd June, 12 – 6pm. East Finchley Festival, Cherry Tree Wood (opposite station, off High Rd N2). Lots of stalls, including Finchley Society and Barnet Borough Arts Council. Thursday 26th June, 8pm. Finchley Society, Drawing Room, Avenue House, East End Rd, N3 3QE. AGM, followed by refreshments or wine and cheese. Non-members £2. Wednesday 28th June, 7.45pm. Friern Barnet & District Local History Society, North Middlesex Golf Club, The Manor House, Friern Barnet Lane N20 0NL. The Foundling Hospital of Barnet. Talk by Yvonne Tomlinson. Visitors £2. Refreshments and bar. Monday 30th June – Friday 4th July, Monday 7th – Friday 11th July & Monday 14th – Friday 18th July, 10am – 5pm. EXCAVATE LONDON at Headstone Manor, Pinner View, North Harrow HA2 6PX. Five-day courses taught by MOLA archaeologists and MOL curators. Fee: £295 for one week, including sandwich lunch. Book on 020 7001 9844.